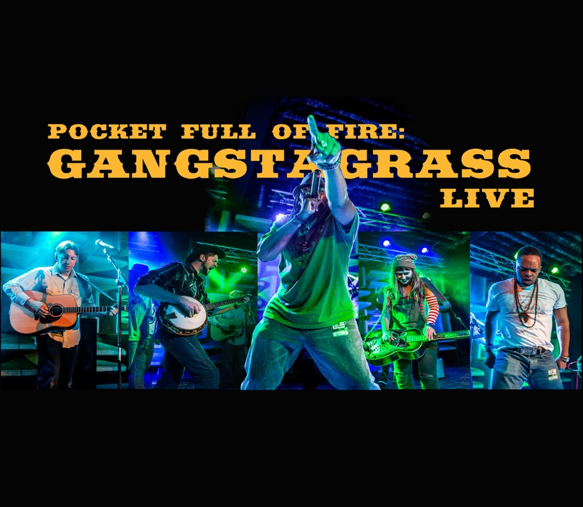 Gangstagrass Illuminates the Skies With Live Album, “Pocket Full of Fire” Out Now! Gangstagrass has been cooking up the heat to stun their fans once again by releasing their 5th album and first live recording, “Pocket Full of Fire” on February 15th. The response thus far has been incredible including Billboard’s Bluegrass Albums Chart Debut at #8. They used the International Folk Alliance Conference as the vehicle to create momentum and buzz whilst performing the moment it was available on all streaming devices. They walked away from the conference as one of the most talked about artists taking home endorsement deals, and booking agencies for territories outside of the U.S as well as grabbing the cover story for Cashbox Canada. The live recording is independently released by RENCH Audio and distributed by ONErpm. Brooklyn based Producer Rench has brilliantly come up with a genre of their own, Bluegrass and Hip-hop. These two opposite genres that collide together play a distinct role in our American music culture. Their new album features their latest singles, “Barnburning” and “Keep Talking”. “Another big name at the conference was the bluegrass and hip-hop fusing Gangstagrass. Popularized by their musical appearances in the television series Justified, they’re one of the few genre benders who has gained the respect of many roots fans for not watering down the music of hip-hop and bluegrass to create the widest possible audience, but approach both genres with respect. Think less Florida Georgia Line, and more Kendrick Lamar collaborating with Del McCoury. They’re not genre benders, they’re genre fusers, leaving all the hard edges on the music, and illustrating the shared themes of hip-hop and country when not watered down for the masses. It still feels more like a mashup than something that’s conjoined seamlessly, but folks have a hell of a good time listening to them. They were at Folk Alliance promoting their new live album Pocket Full of Fire”. Music to Life says this about their social and political impact. Gangstagrass’ Producer Rench is an Emmy nominated, billboard charting musician and producer. Rench was nominated, along with rapper and actor T.O.N.E.Z, for an Emmy for the Gangstagrass song, “Long Hard Times to Come” used as the theme song to the hit FX series “Justified.” Premiering in 2010 and running for six season, the series and the emmy nomination have garnered a wide audience nationally that continues to grow – the most recent Gangstagrass album debuted at #5 on the Billboard bluegrass charts. “While we are very proud of our studio albums, there’s just something about our live shows that you can only get if you’re there in the room. We do our best work onstage, and this album captures some of our best shows, in our favorite rooms, with crowds that support us and give us amazing energy that we give right back.” Banjo player Dan Whitener. The 3rd single from ‘Pocket Full of Fire’ “You Can Never Go Home Again” is out Friday, March 8th. Recorded in Chicago at Evanston’s Space.